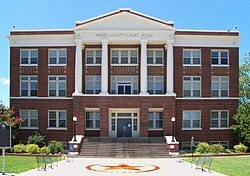 Wood County is a county in the state of Texas in the United States. In 2010, 41,964 people lived there. The county seat is Quitman. The county was named for George T. Wood, governor of Texas from 1847 to 1849. ↑ David W. Gilbreath (June 15, 2010). "WOOD COUNTY". Handbook of Texas Online. Texas State Historical Association. Retrieved 15 May 2015. This page was last changed on 20 April 2018, at 20:47.